← Will The Rightline Gear Window Storage Bag Hold Aftermarket Soft Top Windows? Spotting a Wrangler LJ is like spotting a white whale and equally as cool. We have received a few questions as to whether or not the windows from an LJ will fit inside our Soft Top Window Storage Bag. Owners of the LJ Wranglers face the standard issues – where do I put my soft top windows when removed and how do I keep them from getting scratched? Even more-so when I want to take them along for the ride. The challenge with the LJ side windows is that they are quite a bit longer than the regular TJ windows. With the help of a friend who owns an LJ, we were able to test fit the soft top side windows inside the Soft Top Window Storage Bag. You can see in the photo that the fabric portion of the window extends several inches past the end of the sleeve, and just slightly out the side. 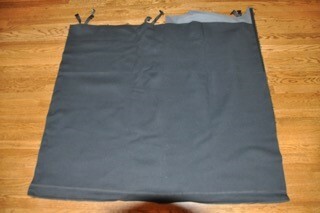 However, the clear vinyl portion of the windows is protected inside the neoprene pocket. The quick release buckle straps will still close around the sleeve when rolled up. We are excited to say that the Soft Top Window Storage Bag provides a window storage solution for the rare Wrangler LJ!